Where the west meets the east. Where the old meets the new. And the devil is in the details. In the year of 1632, Ahmed Çelebi-- outfitted with a set of man-made wings-- stands at the top of the Galata tower. Fifty-five meters off of the ground, Çelebi approaches the tower's ledge. With each step, he feels his wings grow heavier on his shoulders. His sweaty hands adjust his shoulder straps as he looks over Istanbul's Galata district. In the distance, the Çelebi sees the Blue Mosque and dozens of minarets jut from the city scape into the horizon. He feels the high winds pull at his wings. The echoes of cawing seagulls muffled by the roar of blood rushing in his ears. It's now or never. Çelebi bends his shaking knees. Breathe in. He looks across the continent, across the Bosphorous, across to Asia. Breathe Out. He leaps. According to Turkish historian Evliya Çelebi, Ahmed Çelebi glided two miles across the Bosphorus strait to Doğancılar Square, becoming one of the earliest examples of sustained human flight. Now, it's 2018, and you've just boarded your three hour flight from Paris to Istanbul. You've been greeted by your flight attendants and you slowly shamble to economy class and carefully scan the overhead lockers for seat: 20D. You find your aisle seat, you stow your bag in the crowded overhead compartment and you sink into your seat, trying to get as comfortable as you can without disturbing the mother and child beside you. The orchestra of languages: French, Arabic, Russian, English, Turkish begin to settle as passengers find their seats, and flight attendants make their final inspections. The engines outside begin to whirl. Breathe in. A discord from the orchestra: the baby next to you begins to cry. Breathe out. Flying could be worse. Your destination is Istanbul. 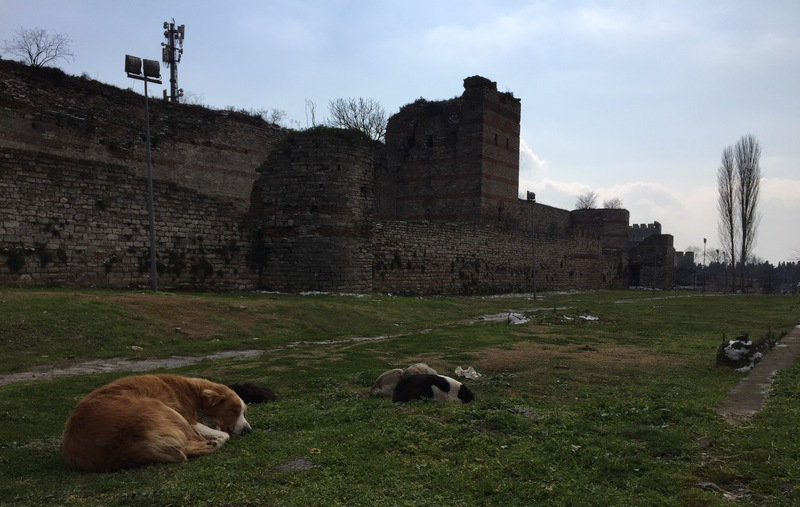 For many, Istanbul may invoke visions of Byzantine fortresses and Ottoman palaces. For foodies, perhaps honeyed baklavas and mouth-watering kebabs. For the rest: it might just trigger novelty music from the 50's. Remember: it’s Istanbul, not Constantinople. The fact of the matter is that the city has more than enough to offer any traveler. It's easy to get lost in the city, and with 5000 years of history soaked into the land and built into the city, it's easy to get lost in history. But as the saying goes: the devil's in the details and if you're not too careful, you may miss some of the stories Istanbul has to tell. Ladies and gentlemen, as we start our descent, please make sure your seat backs and tray tables are in their full upright position. Make sure your seat belt is securely fastened and all carry-on luggage is stowed underneath the seat in front of you or in the overhead bins. Thank you. It is year 512 BC, and you stand halfway between Europe and Asia. You are one of thousands in the army of Darius I crossing the Bosporus strait. With every footstep, you march further and further away from home and deeper into foreign lands. In front of you the horizon bobs up and down as the pontoon bridge floats in the open water. Below you the water guzzles as the boats, which the bridge is built upon, dip and rock in dark water. The air is filled with clopping hooves, neighing, and clanking metal as the wooden planks below creak and moan under the weight of Darius's army. You pray that the bridge is secure, knowing that the closest shore is half a kilometer in either direction. Across the water you see the conquered Byzantium, the peripheries of the Greek colonies. Fishing boats litter the strait as they catch their days work, circulating like bees in and out of Byzantium's ports. Your mind wanders to thoughts home and future battles. According to records from Herodotus, King Darius I marched his army of approximately 700,000 men and horses across the Bosporus Strait during his Scythian expedition. Splitting the city in halves, the Bosporus strait serves as the natural boundary between the Asian and European continents. Along with its geographic importance, the strait is also the sole waterway which unites the Black Sea and the Mediterranean, seeing approximately 48,000 ships pass through its waters annually. Due to its commercial and military importance, the Bosporus has served as the cradle for the 2600 years of settlement along its shores. However, despite the strait's importance throughout history, its first bridge linking the halves of the city and continents-- the 15 July Martyrs Bridge-- was only created in 1973, about 2600 years after Darius's initial crossing. 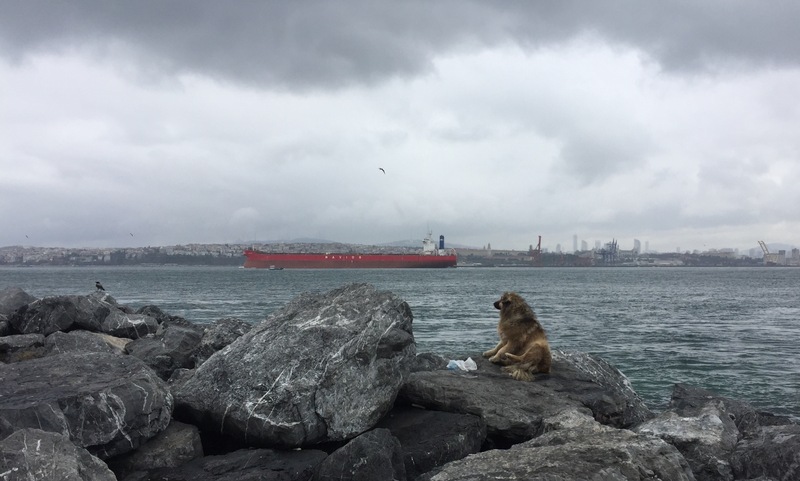 Today, the wooden fishing vessels now share the Bosporus with larger beasts such as steel cargo ships, cruise ships, and even naval destroyers. It is the 9th Century, you are a member of one the most elite fighting forces in the known world-- the Varangian Guard-- and serve as the personal bodyguards of the emperor himself. At the heart of the Byzantine Empire, in the halls of the Aya Sofia, you and your fellow Norse men exchange stories of conquest, of wars in distant lands, and recount images of your northern homes. The walls seem to listen to every word and the stone foundations echo stories from their homelands of Egypt and Syria. The columns taken from the Temple of Artemis boasts an ancient history, and mosaics tell tales of Christ. The colossal golden dome, looms above you as if suspended from the heavens. Four centuries of Byzantine might resonates through it's halls, and you decide to etch yourself into the narrative. In 1964 Viking script dating back to the 10th century was discovered on one of the marble parapets of Aya Sofia's southern hall. While it is not clear who the original etcher was, the name "Halvdan" has been translated out of the Norse runes. 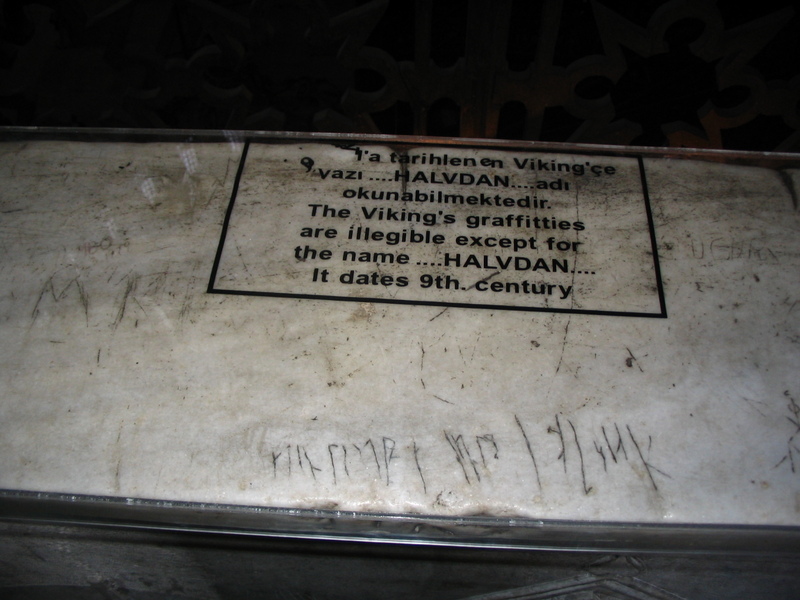 The suspects of this early graffiti is thought to be the Varangian Guard. The Varangian guard was created around 987, when Emperor Basil II faced an uprising within the walls of Constantinople. Vladmir the Great of the Kievan Rus gifted the Byzantine Emperor with 6,000 Vikings known as Varangians, to ward off the insurrection. Impressed by the Vikings effectiveness and ferocity in battle, Basil II recruited the Vikings who served as the personal bodyguard of the emperor. As a mercenary group with no local allegiances and unable to communicate with the local populace, the Varangians served as reliable defenders to the Emperor. The Varangian Guard became known as an elite fighting force, serving in Byzantine conquests from Italy to Syria. 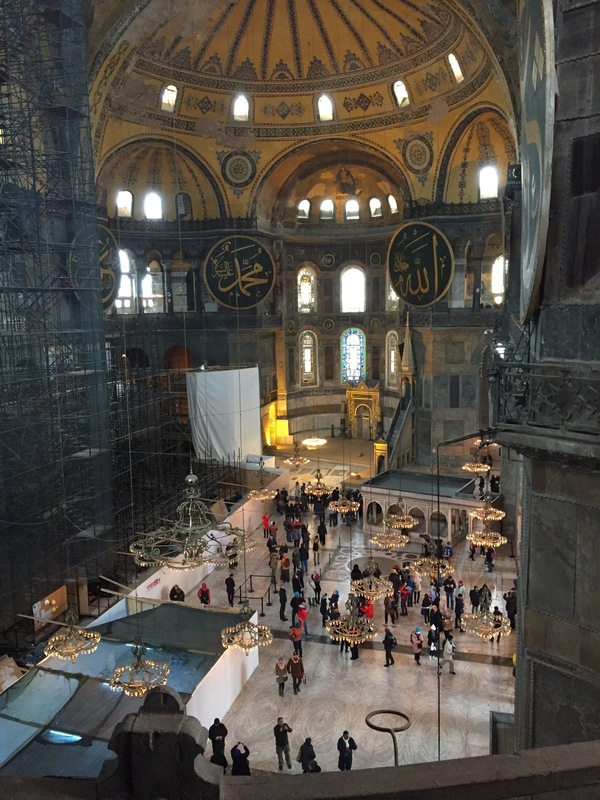 Despite their notoriety in the medieval world, today tourists may catch a glimpse of their infamy as it shines through a few runic etches of graffiti in the grand Aya Sofia. Today the walls of Aya Sofia no longer listen to tales of crusading or medieval conquests, but echo tales of far-off lands as tourists swarm its inner halls. The air is filled with a flurry of languages from Chinese to Spanish, camera flashes bedazzle the buildings ancient walls and tour guides stand at parapets preaching to their tour groups. It is 1493 A.D. at the second Ottoman Siege of Constantinople. A millennium ago, the Byzantine emperors ruled lands from Spain to Syria. Today the Byzantine emperors reign goes no further than his cities walls, but his city walls stood grand. As you march to the front line, the Theodosian walls rise from the horizon. At the base, a 20 meter wide moat hugs the walls for kilometers in either direction. Just across the moat a 9 meter high outer wall oversees the moat, ready to release spears and Greek fire on any swimming invaders. However the crux of the wall is the towering inner wall which stand 12 meters tall, where rows of archers stand ready to blot the sky with volleys of arrows. Murmurs stir, as morale begins to break. Brothers in arms begin to mutter final prayers, fearing the days end. Suddenly the sound of horns command your unit to halt, as Mehmed II releases his secret weapon for another barrage. You turn to see it fire. The "Basilica", an 8 meter long cannon capable of firing 250 kg stone balls over 1.5 km. The air cracks, as the Basilica releases its payload, followed by smaller cannons which pepper the walls of Constantinople. Your heart buckles, at the thunderous sound of cannon fire. Cannon balls sink into the walls like marbles into sand. In a minute the barrage is over. The air is filled with a stunned silence and the smell of gunpowder. Your heart pounds inside your chest, as you watch the cloud of dust settle around the walls. The chirping of crickets return, followed by dread. A horn sounds and commands the final assault. Your unit begins their charge. After a two month siege and multiple assaults, Constantinople was finally conquered on May 29th, 1453. While the conquering of Constantinople highlights the fall of the Byzantine Empire, for some historians, it also highlights the end of the Middle Ages. The walls which protected the Byzantine Empire for 1123 years, became null with the introduction of cannons to siege warfare, thus changing the nature of warfare forever. The invention of the Basilica survivors who fled the doomed city took with them their books, and ancient traditions passed on from Greece and Rome, and as they began to resettle on the Italian peninsula. 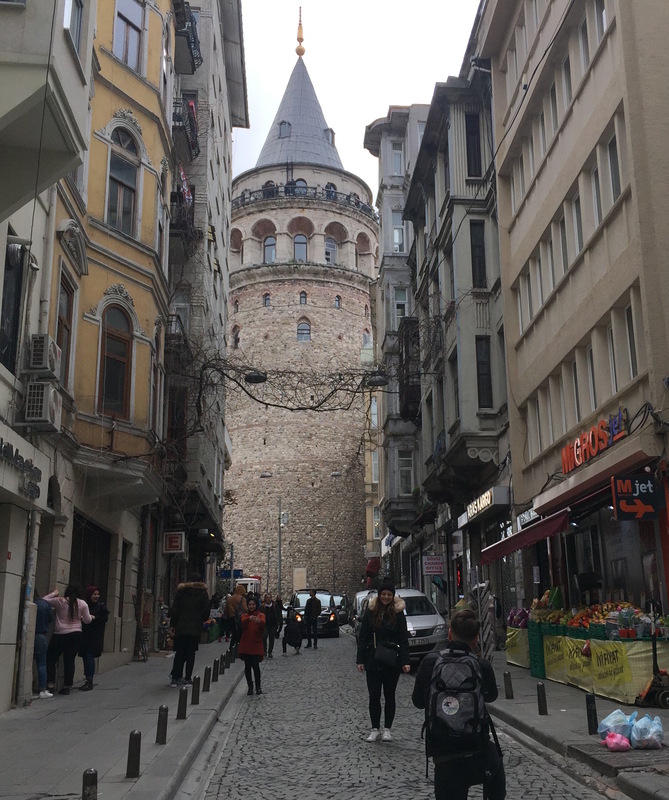 While parts of the wall have been recreated and renovated, much of the wall has fallen to disrepair, and has become a shell that Istanbul has outgrown. Today the walls no longer protect its citizens, but rather divides them as Istanbul develops residential areas on either side of the walls. The moat which once challenged invaders to swim, have since been filled in and has become green spaces where stray dogs can be seen lounging about. The palisades which once shielded archers, now harbor the homeless as tents and makeshift shelters can be found along the walls rubble. The walls which once defined a city, has now since been consumed by it. Malick is a student at the American University of Paris, he studies Global Communications and Journalism. His interests include: Brazilian Jiu Jitsu, and getting caught in the rain. He's not much into health food, he is into into champagne.